Trinity Thirty is a celebration and reinterpretation of the much beloved Cowboy Junkies classic The Trinity Session, on the occasion of the album’s 30th anniversary (originally released in late 1988). The idea was spawned when Berlin-based Canadian producer Scott Monteith — best known as DJ and dub-inflected minimal techno-electronica recording artist Deadbeat — heard the Junkies’ Trinity version of “Sweet Jane” playing in an airport a few years back. Viscerally reminded of how much he loved the album, and how surprisingly overground the record ended up becoming (in fact by mid-1989 The Trinity Session would be certified Platinum in both Canada & The USA truly another era), Monteith immediately reached out to the band to ask if they had anything planned for its 30th birthday (the Junkies had previously commemorated the album on the occasion of its 20th anniversary by re-recording it as Trinity Revisited). Before Monteith even touched down back in Berlin, the band had replied that same day saying they had no such plans but would enthusiastically support whatever angle Monteith/Deadbeat might want to run with. Monteith then recalled conversations with musician/producer and fellow Canadian-in-Berlin Fatima Camara (whose acclaimed debut solo album Before We Sleep came out on Parachute Records in 2016) about their shared love of The Trinity Session, feeling she’d be the perfect partner to involve in a reinterpretation. Camara was thrilled by the idea, and the two began meeting to explore how to approach things conceptually and aesthetically. This would be their first collaboration – and their first time placing their own vocals at the forefront of a project (joined by guest vocalist Caoimhe McAlister to add harmonies on certain tracks). The Trinity Session is rightly celebrated for its naturalistic, profoundly languorous covers of classic tunes and traditional work songs (“Sweet Jane”, “Blue Moon”, “Mining For Gold”, et al) – and is also legendary for having been recorded with a single microphone in single takes at a church in Toronto, with no further mixing or overdubbing. 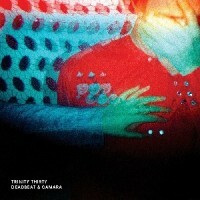 While Deadbeat and Camara couldn’t entirely replicate this approach as a duo, for Trinity Thirty they similarly re-recorded everything with single mics in a big open space at Berlin’s Chez Cherie studio, relying heavily on natural room acoustics, committed to raw first takes, guided by an overriding strategy of slowing down all the tempos as far as they could while continuing to channel the warm asceticism of the original album. Initially imagining they would run a fair amount of electronic treatments during the mix, Deadbeat and Camara instead found themselves absorbed by the spaces and silences, guided by a spirit of preservation and restraint, in homage to the original. The result is “a less electronic album than we imagined making”: a gorgeous somnambulant collection of ‘covers of covers’, where the reference point is always the Cowboy Junkies original approach, stretched to new and beguiling limits of deceleration and narcotized spaciousness – a sensibility further reinforced by the mastering treatment of minimalist dub-techno legend Stefan Betke (~scape, Pole). Trinity Thirty is a wonderfully languid, subtly avant-garde, conceptually reverent acoustic-meets-electronic interpretation of this classic album.